Seniors Peyton Graves and Riley Webb light the bonfire. 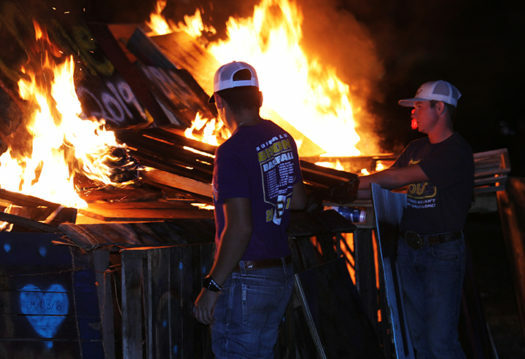 The homecoming bonfire was back at the high school campus and had a DJ and food trucks added to the evening to add to the fun. Students began on Tuesday morning to search for wood pallets to burn. After they collected a couple trailorfuls, they began to start building near the football field. It is really important to have several adults supervising the event to ensure the safety of students and faculty members. The teacher on top of the pile was Physics teacher and Cross Country coach Kyle Gleghorn. Once all the pallets were gathered, students began to paint their names on pallets. A group of students started this the night before in order to be more productive the day of. At the bonfire, there were many booths including food, a DJ, the actual bonfire and an assortment of games. This bonfire was very important to all the students but especially the seniors, seeing as it was their last one. Of course safety was an important factor. The fire department was on hand to monitor the fire and to keep the area surrounding it wet. To make sure everyone behaved, Police Chief Lance Pavelka came to monitor.